The design of a small room can be problematic. Small living room of 12 sq. meters with the correct layout is a multi-purpose room, where you can relax, watch TV and have meals. Get acquainted with 130 square feet living room most effective design ideas of organizing small rooms with real-world projects on photos. The design of a small living room is a difficult task, especially for people who have never previously decorated their own living. This article contains expert knowledge and descriptions of tips on how to design a small living room on 12 square meters. Creating an interior of such a room will not be a problem if you know how to visually increase a small living space. Of course, you should choose light colors of walls (pastels, shades of white and beige) in a small living room. But if such colors are not your priority, you should decorate one wall in a brighter shade. The use of saturated colors (orange, red, purple, green) will create an ideal background for the furniture. Another idea for decorating the walls of a small living room is the combination of different shades of blue, for example, in the form of strips. The transition of one color from light to dark will help to get the effect of attractiveness in a small living room. You will achieve even better results by choosing cool shades of neutral colors for your small living room of 130 sq. feet. The walls in cold gray or blue seem more remote than they really are. Sometimes a large dark surface, for example, the entire black wall creates an impression of depth, and also optically enlarges the space. Sometimes it’s worth experimenting in a small room. Do not forget about the shiny surfaces. Lacquered furniture reflects light. Thus, the glossy floor and large mirrors will work in a small living room perfectly. Furniture in a small living room should organize the order and do not take up too much space. You should choose such interior items that will make the room seem bigger, optically rearranging the space and expanding the perspective. The size of furniture is of fundamental importance, because, in addition to performing its direct functions, it must still allow relatively free communication in a small living room of 130 square feet. It is desirable to keep the necessary access to the window or balcony, and also open the way to the kitchen to easily carry there something hot or heavy. Furniture for a small living room should be light enough so that it can be easily moved. Often two small coffee tables will be better than one large. They can stand next to each other or on both sides of the sofa, depending on the situation. If an armchair fits into a small living room, so this is excellent, you can safely use it. Advice! The design of the living room is primarily about functionality. Therefore, the furniture for this room should be multifunctional and foldable. Tables with drawers, pouffes with storage, a small closet on wheels are the main items in the list. This will allow you to combine furniture with the personal needs of homeowners and the size of the living room. When it comes to furniture colors, a small living room of 12 sq. 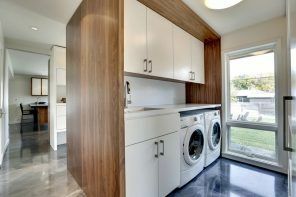 m will be better organized with cabinets, nightstands, tables with smooth fronts without decor. Varnished facades, glass, large mirrors or reflective surfaces are welcomed. A Small Living Room: How to Choose a Sofa and other Accessories? The sofa is the most important element of the living room’s interior. In a limited area, it is perfect to be modular, since it gives more design possibilities. If you do not like the modular design, then you can choose a classic folding one. It turns out that a fashionable corner sofa is completely unsuitable for a small interior, as it can reduce the size of the room even more. When it comes to the color sofa, preferably if it is of saturated with shades: black, gray, orange. mirror on the wall or cabinet. Advice! The interior must be functional and tailored to individual needs. Closed cabinets, low furniture, shiny fronts, plasma TVs hanging on the wall, are good choice in a small living room of 12 sq. m.
Kitchens have long been an integral part of the living rooms especially in small sized apartments. The combination of these two rooms often has a positive impact on both their functionality and aesthetics. However, how to combine two different zones with different functions in color? Should there be apparent boundaries showing the place where the living room ends and the kitchen begins? This will shape the style of the living room and kitchenette located in it. According to the latest trends, the application should be quite coloristic and stylistically harmonious, but not stand out too much. The less visible is the area of ​​the kitchen the better is for the living room. In small rooms, light and uniform colors predominate. The colors of walls, furniture and equipment often represent a composition in which neutral tones are subtly combined, but slightly varied in shades. These small differences create the impression that light plays in the room. Living room 130 square feet can easily be made beautiful and functional with enough free space left. Choose the most liked design projects in the presented photo-gallery, in order to immediately proceed to decoration of your dream room.